If you are looking for a job in Assam, here is the good news for you. Corporation Bank has published a notification regarding their latest Recruitment in various posts by Corporation Bank Jobs in Assam 2017. Corporation Bank invites eligible people to filling ip application for the post of Manager(law). This posts is advertised by Corporation Bank to recruit eligible candidates for their department. You can apply for the post if you have the eligibility mentioned above. Apply for the post of your choice and build your Career this year. (iii) have a valid personal email ID, which should be kept active till the declaration of results of this selection process. Bank may send call letters for the Examination etc. through the registered e-mail ID. Under no circumstances, a candidate should share with/mention e- mail ID to / of any other person. In case a candidate does not have a valid personal e-mail ID, he/she should create his/her new e-mail ID before applying on-line and must maintain that email account. (1) Candidates are first required to go to the Banks‟s website www.corpbank.com and click on the Home Page to open the link “Careers” and then click on the option “CLICK HERE TO APPLY ONLINE FOR Recruitment of Specialist Officer 2017-18” to open the On-Line Application Form. I have shared all the important knowledge for the upcoming Corporation BankRecruitment here. For more about AssamCareer jobs click here. I will help you as much as I can. This is completely free service for from me. 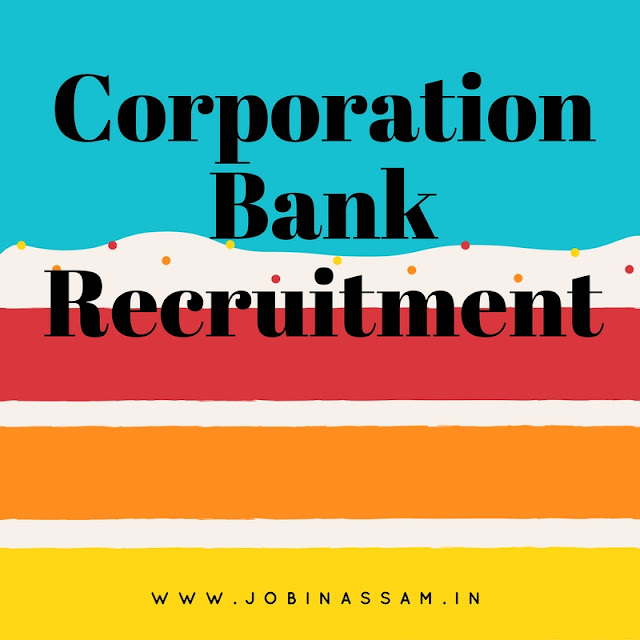 Corporation Bank will be a good job for you if you are eligible for the post mentioned above, apply before the last date. Monthly pay for the Corporation Bank job is also good.